The old reptilian brain is the snake; it is the brain of the instinctive, the unconscious, the depository of millions of years of evolution. The second brain is the limbic ring, the mammalian brain of “fight or flight,” of emotion and a highly developed olfactory sense as a way of perceiving the environment. This limbic ring is the nest of the bird, the phoenix or quetzal. The third brain, the neo-cortex, is the bird, the creature of the higher realms of thought. The twin hemispheres of this brain are the two wings at the top of the cadaceus, the sign we still see today as an emblem of the medical profession. Now the reason these three brains are symbolically emphasized in various esoteric schools of religion is that as soon as one moves out of the conventional life of society into the mysteries of the temple, he or she undergoes a spiritual evolution in which the evolution of the nervous system is re-experienced in a form of recapitulation. 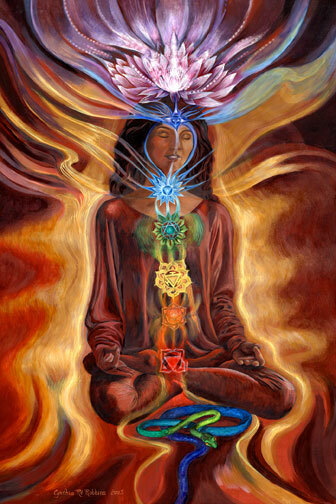 When consciousness is focused with unwavering attention, the body responds. In the first stage of tantric practice, the instinctive life is energized and one feels an enormous amount of physical and sexual vitality. During this stage of earthly energizing, the practitioner is counseled not to identify with or act out of these sexual energies. Celibacy is the rule. If the rule is followed, and if the contemplative practice is continued, then the serpent begins to climb the tree of the spinal column. In this second stage, the second brain, the mammalian brain, is energized. It is a time of raw emotion and ancient senses. One’s passions begin to be wildly intense, fits of crying take one over without obvious cause. Long buried and repressed childhood emotions explode to the surface, and the sense of smell begins to challenge the supremacy of sight as a way of interpreting the world. One begins to smell “auras” rather than see them. One begins to know and respond to people instantly, the way a dog would: lovingly wagging one’s tail at this stranger or barking angrily at another. And at this stage, too, the student is counseled not to identify with or act out of what he is feeling. it is a dangerous time, for the physical and psychic energies can make the individual appear to be quite charismatic, but if the individual involves others in his shifting and unstable fantasy life, then great confusion and suffering can be experienced by more people than simply the student. Jonestown is one of the more extreme examples of the dangers of this second stage. The third stage is the stage of the bird. In the place where three brains come together, “the place where three roads cross,” is the place of integration, the traditional “third eye.” “For the eye is the light of the body, and if thine eye be single, then is thy whole body filled with light.” (Matthew 6:22) After years of focused concentration and visualization practices, the third eye opens and the student shifts upward from a physical body to a body of light. The mode of thought shifts from a linear one of sequential words and thoughts to a hieroglyphic one of multi-dimensional geometrical figures or crystals that are at once musical and mathematical forms: it is as if two Bach fugues were being played at right angles to one another. Plato’s world of form and Sufi angelology begin to take on a whole new level of reality. Now, just as there is a shadow side to the second stage, a stage that is caricatured in Jonestown, so is there a shadow side to this third stage. The shadow form could be called “paranoid-schizophrenic cosmic synthesis.” The hieroglyphic mode of thought is isomorphic to, but not identical with, “schizophrenic word-salad.” In these psychotic cases certain traumatic experiences have crushed the ego, and the being is rawly exposed to altered states of consciousness without any yogic training whatsoever. In other cases, through drugs or moments of evanescent artistic rapture, the individual slips momentarily into another mode of thought. Shakespeare long ago noticed that “the lunatic, the lover and the poet are of imagination, all compact.” But the difference that makes a difference between the yogi and the lunatic is that the lunatic is in a condition of acute agony, suffering and existential terror, whereas the other is in a condition of stable, balanced and creative joy. The paranoid organizes his entire universe around his central dread; his chaos is transformed into one gigantic coherent, and cosmic conspiracy. He, and only he, has discovered “the secret.” And here too is another aspect of the shadow form of the third stage: the cosmic inflation of the ego. A contemplative in a monastery or esoteric school knows that he or she is simply one of a long line of contemplative practitioners, stretching back from the present into the mists of prehistory. And if the monk or nun begins to get a little overenthusiastic about his divine mission in life, the abbot is there to remind him or her to sweep the floor and clean the toilets. Ultimately, the third stage must be a return to the first. Thank you for posting this article and source. Glad you appreciated it! Thompson is far one of my favorite authors on this subject. Excellent article. I have also some views for this article. describe some of the views of great Seers and Saints of our time. chakra which corresponds to optic chiasma. dear shamansun! can you help me, who is the artist of the first beautiful picture? For a complete novice, what would you recommend as a good source of literature to begin learning more? To be honest, I find a lot of modern literature to be lacking in one way or another, on this subject. I really wish I could recommend to you a single book, to my knowledge, which would be a great, modern introduction to these topics, but I don’t think there is one. The problem is, with this literature, you have the mystics on one end who *get* the imagination and myth and creativity, and on the other end, you have more rational-minded, literal folk. Ken Wilber is a good example of a very linear thinker. He’s more recent, sure, but you’ll miss out on the depths. These days, the EnlightenNext and Ken Wilber communities are spearheading “evolutionary spirituality.” But I think they are truly missing the soul of the work. One classic, profound book from the 80’s is by William Irwin Thompson, called The Time Falling Bodies Take to Light. If anything, just read the first chapter to that one. Older books concerning spiritual evolution: The Phenomenon of Man by Teilhard de Chardin, The Life Divine by Sri Aurobindo. These two are heavy-writers. Meaning they have really verbose writing styles. They’re hard to follow. Another classic mystic and writer on this subject is Rudolf Steiner. He has a beautiful imagination and mystical outlook on the evolution of human consciousness. His follower, a British man who was friends with C.S. Lewis and Tolkien, was Owen Barfield. He wrote a lot of great books too. Again though, these are all “heavier” guys who are just not accessible to the general public anymore. Gary Lachman has some great books. Actually, the most introductory one I can think of is this: A Secret History of Consciousness. Lachman has also written extensively on some of the writers I’ve already mentioned. This is probably the *best* place I can offer you to start reading. He is an accessible, easy writer who can convey depth without losing the audience. Does this help so far? Colin Wilson has a book called The Outsider, a classic 1950’s book. He also has a book, more recently, called Superconsciousness, the Quest for the Peak Experience. Any books on kundalini yoga, the chakras, and psychology might be interesting. I would just be cautious with how far to take the theories. Carl Jung’s work, or maybe authors who wrote about him, might also be helpful. Hope this all helped you, if only a little bit. Again, I wish there were more contemporary authors who spoke about all these things. Maybe I’ll end up writing that one. Gary Lachman writes for a good magazine called Reality Sandwich. That community is an excellent resource and they often post great articles. Some of it might be “too far” for a general audience, though. They also strongly focus on psychedelics. So just be warned, if you’re not interested in that route! They have good introductory pieces on spiritual evolution, but again, I advise some caution because, at least in my opinion, there are critical dimensions left out.